Our company is highly experienced in the towing and recovery or your vehicle. We also can help with unwanted car removal or tow away, transportation, recovery and storage of vehicles and equipment. We have a number of Towing trucks dedicated to the industry that are regularly maintained. We are one of the most respected Towing companies in the Dublin area, we have established our brand being recognised as most reliable, professional, on-time and affordable. 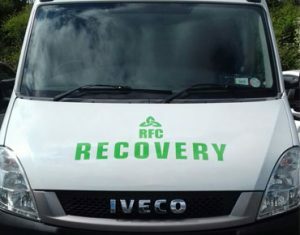 Our customers have come to rely on consistent high level of service they receive from RFC Towing and Recovery service. Let us provide you with a variety of towing and recovery services, all offered at reasonable rates. For your convenience, we are certified service provider, and we operate a full-service, vehicle towing and recovery service centered around you our customer. We have breakdown towing service that can help you if your vehicle breaksdown in the Dublin area. Simply reach out to us for assistance, and our state-of-the-art GPS dispatch system will locate you with precision and send across a truck to aid you in no time flat! Roadside assistance goes beyond breakdown assistance, and the need to have reliable access to cheap or fast breakdown towing, roadside assistance in Dublin has become crucial. If you haven’t opted for a roadside assistance membership or if your membership has expired, you might find yourself in a sticky spot if you need assistance. Sadly, many towing companies use your desperate situation to take advantage of you. Instead of opting for complex membership plans and spending more than you need on getting a bit of help while you’re stranded, just give us a call and let us know what has happened, and we’ll be there fast. Drive with free mind, safe in the knowledge that we are here on call at any time you need roadside assistance. Just let us know what has happened, and we will be there with the right equipment to help you. We have backup services that can provide us with additional equipment such as a crane on hire, if needed. Apart from recovering your vehicle and getting it to a holding yard or a mechanic, we can also help you take evidence for insurance if you are too shaken up to do so yourself. But the most important thing is you we will help you get back to enjoying the road in no time!